From "The Official Handbook of the Conan Universe" by Marvel Comics. It appears here in slighty edited form. "I have known many gods. He who denies them is as blind as he who trusts them too deeply." -- Robert E. Howard: "The Queen of the Black Coast"
The Hyborian world knew as many cults and religions as it knew tribesfolk and peoples, and religious practices and beliefs were as often the result of superstitious dread and sorcerous practices as of exalted spiritual yearnings and theological understanding. In any case, the age bred few atheists, and even the most cynical of philosophers accepted the existence of greater beings, both good and evil, as a fundamental tenet of reality. Though the various individual gods were often worshipped within strict geographical boundaries, the age was throughly polytheistic, and it was a matter of course for nations to acknowledge the existence of rival deities to their own. The major exception to this rule was to be found among certain priests and adherents to the god Mitra who declared their deity to be the one true god, deserving of unwavering, monotheistic devotion. 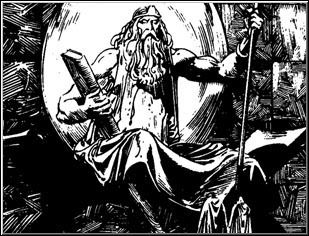 Among the barbarian Aesir and Vanir of Nordheim, Ymir the Frost Giant, lord of storm and war, was chief of all gods, while individual tribes might have their own local deities as well. Ymir's domain was Valhalla, a snowy, shadowy place that was home to warriors fallen in battle; Ymir's daughter, Atali, was said to have appeared to dying warriors as harbinger of their journey to her father's realm. The Cimmerians worshipped a grim and savage god, Crom, Lord of the Great Mountain, who cared little for mankind save to breathe into men's souls the power to strive and slay. The Cimmerians believed in a shadowy afterlife in which the souls of the dead would wander Crom's grey realm aimlessly for all eternity. The Hyperboreans to the east worshipped ancient Bori, while west of Cimmeria the Picts served Jhebbal Sag, the "ancient god of darkness and fear", as well as the Ghost Snake and Gullah the gorilla-god. Unlike the Cimmerians, the Picts had no aversion to human sacrifice, and their black altars were permanently stained with the gore of men, women and children. In the kingdoms of Aquilonia, Argos, Ophir, Nemedia and Zingara, south of Nordheim and Cimmeria, Mitra worship was almost universal, rivaled here and there only by cults of small numbers such as that of Asura, Ibis, Ishtar, and even, to some degree, the Stygian serpent-god, Set. Unlike the battle-minded gods of the north, Mitra was a gentle god. Blood sacrifice was expressly forbidden in the Mitran religion, the rituals of which were marked by simplicity, dignity, and beauty. Unlike pagan idols, the statues of Mitra were mere emblems meant to represent the god in idealized form and not to be worshipped themselves. Koth, which at one time knelt to Mitra, afterwards fell under the influence of Shem and Stygia and abandoned the gentle god for the more sensual rites of Ishtar, as did Khoraja and Khauran. The city-states of Corinthia may each have had patron gods, though Mitra-worship was known there, as was the cult of Anu the bull-god. Zamora, on the other hand, never accepted Mitra but played host rather to any number of weird and mysterious cults and divinities. Most notorious of them was Bel, the god of thieves, borrowed from the Shemites of Shumir, and most horrible was the nameless spider-god of Yezud, worshipped in the form of a giant tarantula sculpted in black stone. The land of Shem also worshipped a plethora of divine beings, most of them fertility gods and goddesses as befitting an agricultural people. Each city-state owned its own patron deity such as Bel, noted earlier, and Pteor, the male sky-god, mate to the Earth-Mother; the latter appeared in several guises as Ashtoreth, Derketo and Ishtar. Ishtar, in particular, was worshipped in rich temples and at lavish shrines with rituals of blood sacrifice and orgiastic frenzy performed before sensuously carved idols of ivory. To the Zuagir tribesmen of the Eastern Desert, Yog, the ancient demon Lord of he Empty Abodes, was considered most sacred. South of Shem, in Stygia, Set the Old Serpent reigned paramount, a reminder of the Elder Gods worshipped everywhere in the pre-human period of history and later feared in the Hyborian kingdoms as the most abhorrent and foul of demons. Indeed, the gruesome rituals of Set worship, carried out in temple, tomb and pyramid, and including live human sacrifice and sorcerous obscenities, only underscored the reason why Set's very name evoked disgust and terror among civilized and barbarian peoples alike. Among the Black Kingdoms Set held some sway, but native gods such as Jullah, Jhil and Gwahlur had large followings of their own, as did countless local demons and spirits. Turan in the east held Erlik and the Living Tarim as holiest of gods, while Zamboula bowed to Hanuman the horrible man-ape god. Farther east in Kosala, the cult of Yajur offered their bloodthirsty god strangled humans, while in Khitai Yun seems to have been worshipped less violently with incense and prayer.